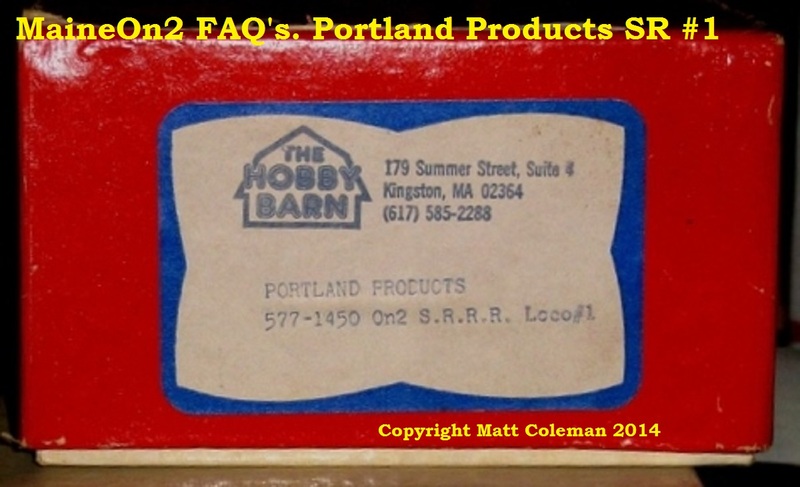 The well travelled Portland locomotive, builders number 622, which served as Sandy River #5, Sandy River & Rangeley Lakes #6, Kennebec Central #4 and Wiscasset, Waterville & Farmington #9, before being moved to Connecticut for more that 50 years. Shown here on it’s return to Maine at the WW&F Museum. 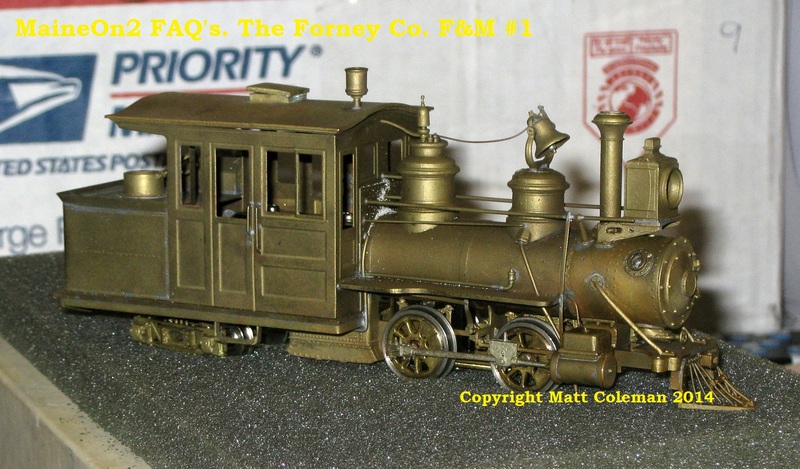 The following notes on individual locomotives were originally compiled (except where otherwise noted) and published by Chuck Collins, and are re-published here with his permission. The introduction, updates and formatting for this blog by Terry Smith. Updated 15-01-2015 and 03-03-2015. The Sandy River and Rangeley Lakes Railroad was formed in January 1908 when the two major groups of shareholders owning the SR and F&M (one group) and the P&R, Madrid and Eustis (second group) agreed to merge. The locomotive and rolling stock fleets were merged and renumbered. The new company operated profitably and paid regular share and bond dividends. In 1911 the SR&RL was acquired by the Maine Central Railroad on the direction of its parent company, the New York, New Haven and Hartford Railroad. Under Maine Central control a number of older locomotives were scrapped or taken out of service and larger replacements were ordered from manufacturers. Track was upgraded, and starting 1915 the MeC rebuilt a number of the SR&RL loco’s with bigger boilers, etc, including enlarging a number of (2-6-0) Mogul types into larger (2-6-2) Prairies. Further locomotive fleet improvements came later with the installation of air brakes and electric headlights. In 1923 the SR&RL defaulted on some bonds and was then put into receivership. The court appointed former owners/shareholders Josiah Maxcy and Herbert Wing as receiver, and then the SR&RL took a long time dying, too long to tell here. Finally after a number of cut backs, closures and re-starts Maxcy and Wing petitioned for closure and dispersal of assets in the Spring of 1935. This was granted and the final narrow gauge rail was removed from Farmington in late 1936. Hinkley #1664 built 1/1884 as Franklin & Megantic #1 V.B.Mead. Rear tank held 600 gallons water & 3/4 ton wood. This locomotive followed the pattern of Monson #1. Used as Franklin & Megantic construction engine beginning October 1884, and for Franklin & Megantic passenger service beginning 10 December 1884. Used as a standby engine following delivery of the former Laurel River & Hot Springs mogul in 1900. Renumbered Franklin & Megantic #2 in June 1905. Little used following purchase of Sandy River #16 in 1907. Renumbered Sandy River & Rangeley Lakes #2 in the 1908 consolidation. Scrapped September 1912 as Maine Central Railroad modernized subsidiary Sandy River & Rangeley Lakes locomotive fleet. Baldwin #8304 built 12/1886 as Franklin & Megantic #2 S.W.Sargent. This was the first Baldwin locomotive built for the Maine 2 foot gauge lines, and was the first to use the outside frames favored by Baldwin. It was the largest 2 foot gauge locomotive in Maine at the time of its delivery. The design similarly represented the heaviest driver axle loading to date. Loading of 5 tons per axle was a half ton greater than Hinkley’s Franklin & Megantic #1. Purchased as a freight engine to carry lumber produced by mills on the recently completed Mount Abram branch. Used as a standby engine following Josiah Maxcy’s purchase of the Franklin & Megantic railroad in 1898. Renumbered Franklin & Megantic #3 in June 1905. Renumbered Sandy River & Rangeley Lakes #2 in the 1908 consolidation. Unused following completion of logging operations at Hammond Field. Scrapped September 1912 as Maine Central Railroad modernized subsidiary Sandy River & Rangeley Lakes locomotive fleet. This locomotive was a reorder of the Billerica and Bedford Ariel design to be used as a standby engine. Built to run tank first. Purchased by Sandy River Railroad following dismantling of Billerica and Bedford Railroad. Rebuilt by the Hinkley Works in Boston inApril 1879 as Sandy River Echo #2 running boiler first and using wood fuel. Used as Sandy River construction engine beginning 25 September 1879. Pulled the first passenger train to Strong 12 November 1879. Sold to Phillips and Rangeley Railroad as P&R #2 Bo Peep in July 1890 and used as Phillips and Rangeley construction engine. Renumbered Phillips & Rangeley #4 and used as a standby engine following purchase of Phillips & Rangeley 2nd #2 in 1893. Used for summer only passenger service between Rangeley and Green Farm upon completion of the Eustis Railroad in 1904. Renumbered Sandy River & Rangeley Lakes #4 in 1908, but little used following discontinuance of Eustis branch passenger service in same year. Scrapped September 1912 as Maine Central Railroad modernized subsidiary Sandy River & Rangeley Lakes locomotive fleet. 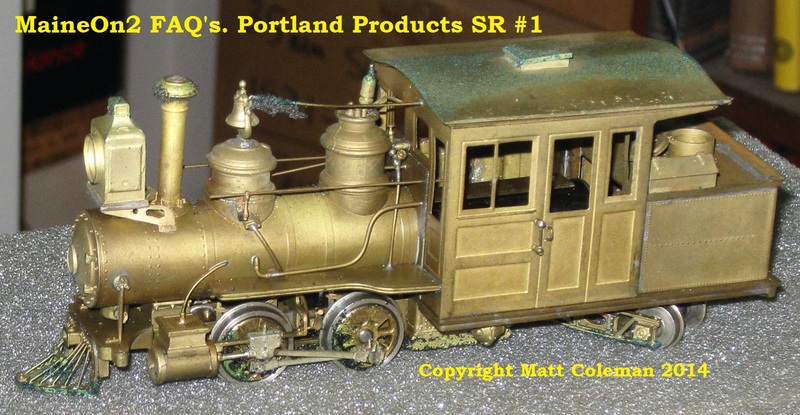 Portland #615 built 10/1890 as Phillips and Rangeley #1 Calvin Putnam. This engine was built in a joint order with Sandy River #4. The two engines reflected Portland Company’s execution of the pattern purchased from the defunct Hinkley Locomotive Works. This locomotive was 20% heavier than the engines Hinkley had built for the Bridgton & Saco River, Franklin & Megantic, and Monson railroads. It was the largest 2 foot gauge locomotive in Maine at the time of its delivery. The design similarly represented the heaviest driver axle loading to date. Loading of 5.5 tons per axle was a full ton greater than the Hinkley design. 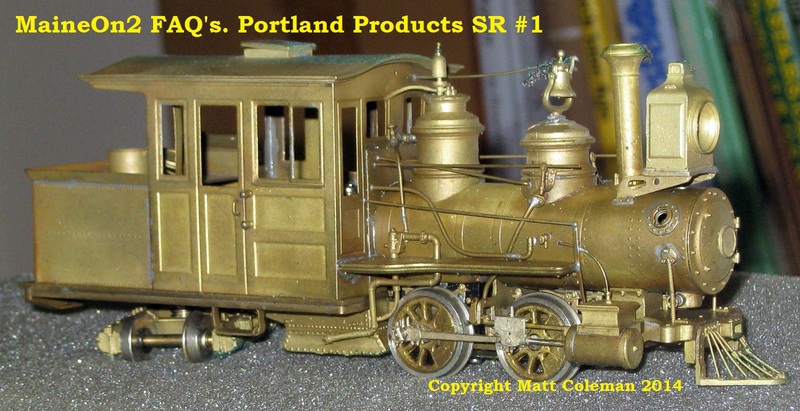 This Portland design proved to be the most successful and enduring for the Maine 2 foot gauge railroads. Forty years later, locomotives of this design pulled the final trains on the Kennebec Central, Monson, and Wiscasset, Waterville & Farmington railroads. This engine was assigned to Phillips & Rangeley passenger service including through trains over the Sandy River during summer months. The original Portland cab was damaged in 1904 and replaced by a less ornate Baldwin style cab. Renumbered Sandy River & Rangeley Lakes #7 in 1908 and used as a standby passenger engine following delivery of Sandy River & Rangeley Lakes #9 in 1909. Derailed at a washout between Kingfield and Salem on 15 April 1912. Rolled over with passenger train during low speed collision with another train at Strong on 8 July 1916. Little used following purchase of Sandy River & Rangeley Lakes #24 in 1919. Stored outdoors in 1923 and scrapped when the railroad was dismantled in 1935. Baldwin #33550 built 7/1909 as Sandy River & Rangeley Lakes #9. Rear tank carried 800 gallons water & 1.2 tons coal. This locomotive served as Sandy River & Rangeley Lakes #9 (1909 – 1936). This engine repeated the design of Sandy River #16 but specified outside frames following experience with the instability of the earlier engine. Purchased to replace the Portland Forneys with more power for the Rangeley Express and became the preferred passenger engine. Fitted with electric headlight in 1919. Fitted with air brakes in1920. Used in mixed train service during receivership. Was the standby engine during dismantling of the Sandy River & Rangeley Lakes Railroad, and was scrapped at Farmington in 1936. Baldwin #44231 built 10/1916 as Sandy River & Rangeley Lakes #10. Rear tank carried 1000 gallons water & 1.5 tons coal. This locomotive served as Sandy River & Rangeley Lakes #10 (1916 – 1936). 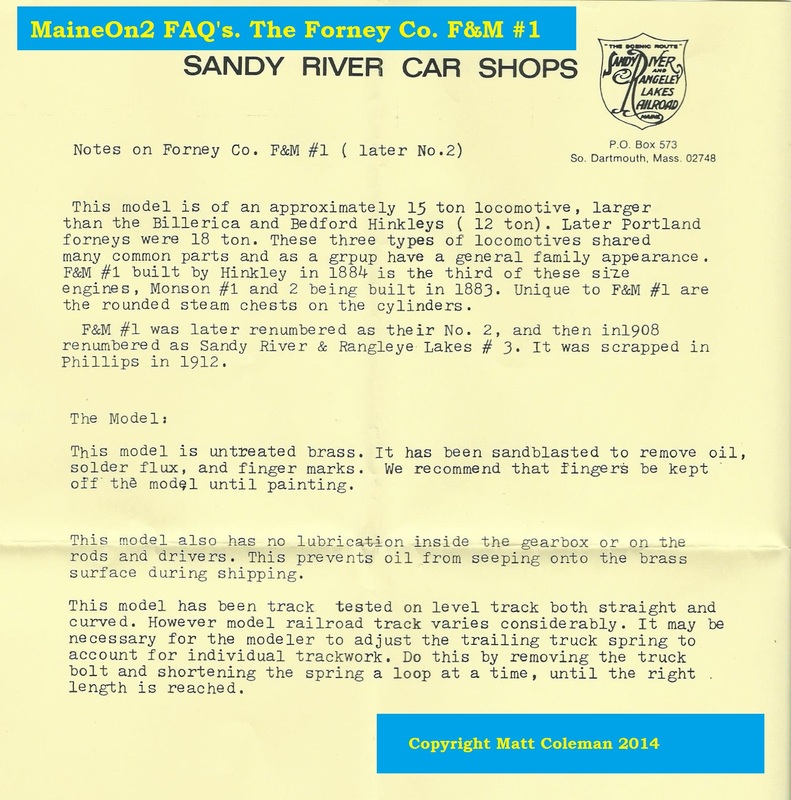 This engine was a repetition of Bridgton master mechanic Mel Caswell’s Bridgton & Saco River #7 design to test applicability of Bridgton & Saco River railroad experience to conditions on the Sandy River & Rangeley Lakes Railroad. 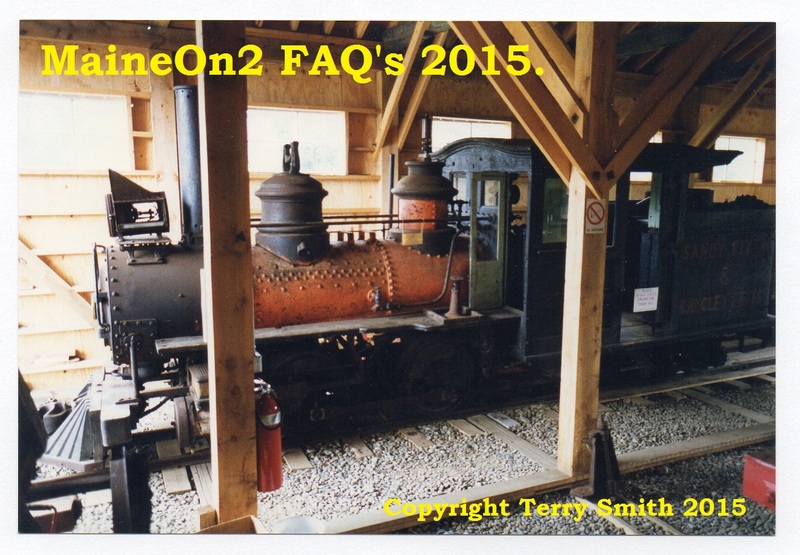 This was the heaviest engine to operate on the Sandy River & Rangeley Lakes Railroad. Weight was destructive on the 35 pound rails north of Phillips and contributed to subsequent abandonment of service over the former Phillips & Rangeley. Never used on the former Franklin & Megantic line to Kingfield or Carrabasset. Burned in the 3 October 1917 Rangeley engine house fire. Fitted with electric headlight in 1919. Became the preferred engine for mixed trains on the heavy rail main line from Phillips to Farmington until service was discontinued in 1935. Derailed 5 miles north of Farmington on 26 December 1929 in the last wreck on the Sandy River & Rangeley Lakes Railroad. Scrapped in 1936. Baldwin #11706 built 3/1891 as Phillips & Rangeley #3 George M. Goodwin. 15 ton tender held 1200 gallons water & 2 tons coal. Rebuilt as a Prairie locomotive in 1912. Baldwin #13276 built 3/1893 as Phillips & Rangeley second #2. For the third time in as many purchases, Phillips & Rangeley Railroad ordered what became the largest 2 foot gauge locomotive in Maine. The design similarly represented the heaviest driver axle loading to date. Loading of 9 tons per axle was twice the loading of the Hinkley engines and almost 50% greater than Phillips & Rangeley #3. This engine similarly doubled the weight of the Hinkley design. Pulling power was similar to Phillips & Rangeley #3 mogul, but the absence of a separate tender made backing easier where no turntable was available. Sloshing water in partially filled leading tenders was subsequently blamed for several derailments on the rough track of logging branches. Phillips & Rangeley #2 proved well suited to branch line logging operations. Phillips & Rangeley management considered axle loading damage to track insignificant over the short useful life of logging branches. Renumbered Sandy River & Rangeley Lakes #17 in 1908. Reboilered by Maine Central Railroad Waterville shops in February 1915. The new 40″ diameter 180 PSI boiler increased engine weight to 28 tons and axle loading to 10 tons. Fitted with air brakes and electric headlight in December 1919. The heavy axle loading was destructive on 35 pound rails and discouraged use of this engine over the former Franklin & Megantic and Phillips & Rangeley after track maintenance was reduced during receivership. Used as a standby engine until the railroad was dismantled in 1935. Scrapped in 1936. This was a repeat of the Laurel River & Hot Springs Mogul design. Purchased to handle increasing volumes of lumber being received from Philips & Rangeley and Franklin & Megantic railroads. Used as the preferred Sandy River freight engine until delivery of Sandy River #8 in 1904. Then used as a standby freight engine. Renumbered Sandy River #7 in June 1905. Renumbered Sandy River & Rangeley Lakes #18 in 1908. Rebuilt January 1916 by Maine Central Railroad Waterville shops adding a trailing truck to support a larger boiler, and a proportionally larger tender was provided similar to the original design of Sandy River #8, and identical to the recently completed conversion of Sandy River & Rangeley Lakes #16. Fitted with air brakes and electric headlight in 1919. Subsequently used system wide in freight and mixed service. Wrecked when Kingfield bridge collapsed on 29 May 1922. Burned in 12 February 1923 Phillips enginehouse fire. Repaired, and received a new tender built by Baldwin Locomotive Works in 1926. Used as a standby engine during receivership. Pulled the Sandy River & Rangeley Lakes scrapping train in 1936. Scrapped at Farmington when dismantling was complete. 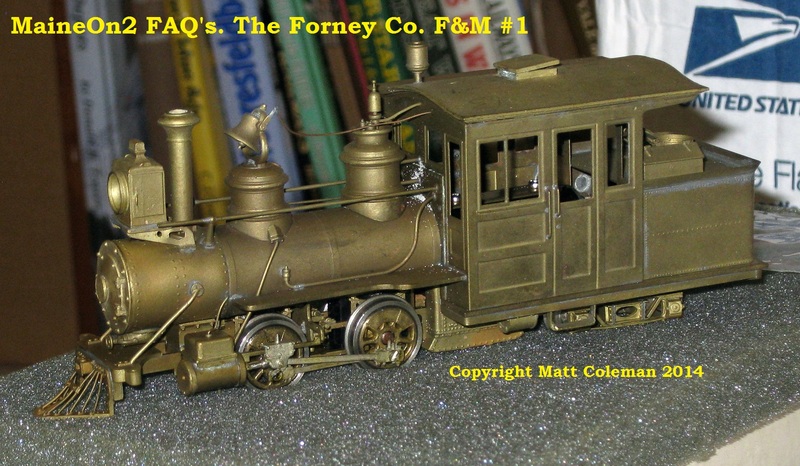 This engine was the first Prairie type on the Maine two foot gauge railroads. A larger boiler was supported by adding a trailing truck to the frame designed for the Laurel River & Hot Springs Mogul, and a proportionally larger tender was provided. Purchased to handle lumber traffic produced by new sawmills at Madrid and Bigelow. Used as the preferred freight engine on the Phillips to Farmington main line until Sandy River & Rangeley Lakes #23 delivered in 1913. Then used system wide. Wrecked north of Strong on 22 March 1907. Renumbered Sandy River & Rangeley Lakes #19 in 1908. Fitted with air brakes and electric headlight in 1919. Burned in 12 February 1923 Phillips engine house fire. Repaired, but unused after 1932. Scrapped in 1935. Sandy River & Rangeley Lakes #20 (1911 – 1935). These notes were originally compiled by Al Wellman. Baldwin #40733 built 10/1913 as Sandy River & Rangeley Lakes #23. 22 ton tender carried 2000 gallons water & 3 tons coal. This locomotive served as Sandy River & Rangeley Lakes #23 (1913 – 1936). This design was Maine Central Railroad’s attempt to increase the pulling capacity of its subsidiary Sandy River & Rangeley Lakes freight engines. Although axle loading was increased beyond the capacity of widely used 35 pound rail, full throttle power under load initiated wheel slip. The design was not repeated, and subsequent Prairie type #24 reverted to the weight and power characteristics of 1904 design Sandy River #8. Purchased to replace 4 pre-1890 Forneys scrapped in 1912. Used exclusively for freight and snow trains on the heavy rail main line from Phillips to Farmington. Fitted with electric headlight in 1919. Not used after 1932. Scrapped in 1936. Baldwin #51804 built 5/1919 as Sandy River & Rangeley Lakes #24. This locomotive served as Sandy River & Rangeley Lakes #24 (1919 – 1937). This engine was a modernized repetition of Sandy River #8. Purchased for general freight service during peak pulpwood cutting for First World War paper contracts. Wrecked on the Madrid branch on 10 July 1919. Tender then rebuilt at Maine Central Railroad Waterville shops in October 1919 to reduce width and improve stability. Wrecked on a plow train near Madrid station on 11 March 1920. During receivership became the preferred mixed freight engine on the former Franklin & Megantic — and, following abandonment of the former Phillips & Rangeley in 1932, system wide during summer months. Purchased by a railfan when Sandy River and Rangeley Lakes railroad was dismantled in 1936. Scrapped in 1937. The Phillips and Rangeley Railroad started building in 1889 from an end-on junction with the Sandy River Railroad at Phillips and ran the 29 miles to Rangeley. It was financed by Boston business men who owned forests north of the line in order to get their lumber products to the Boston markets. The railroad finally reached Rangeley in July 1891. The P&R chartered the Madrid Railroad in 1902 as a paper company which was wholly owned and operated by the P&R, and which never owned any locomotives or rolling stock. It ran for 15 miles from a junction with the parent P&R at Madrid Junction to Bracket Junction and ended as two forks reaching Gray’s Farm and a logging camp called No. Six. In 1903 the P&R chartered the Eustis Railroad as a wholly owned subsidiary company. It ran from a junction with the P&R at Eustis Junction some 15 or so miles to Berlin Mills and Skunk Brook Camp via Dago Junction, and owned its own locomotives. 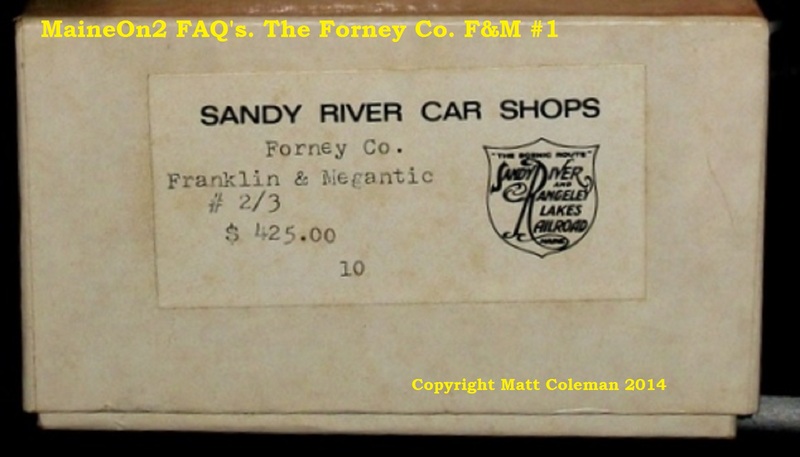 The P&R and its subsidiaries formed one of the two major groups that finally merged to become the Sandy River and Rangeley Lakes Railroad company in January 1908 (the Eustis excepted) and ceased to exist as a separate entities. The Eustis line joined the consolidation later in 1911. See entry for original #2 above for more details.